Twitter is like a runaway train. If you jump on midway through an event or a news cycle, you may as well hop right off again--there's no way you'll catch up. But now Twitter is making it easier to figure out what on earth is going on with related headlines that explain the story behind the tweet. Say a tweet spawns news stories heard round the world, which happens more and more often these days. Now if you click on the tweet's details, Twitter will surface the headlines that embedded the tweet. 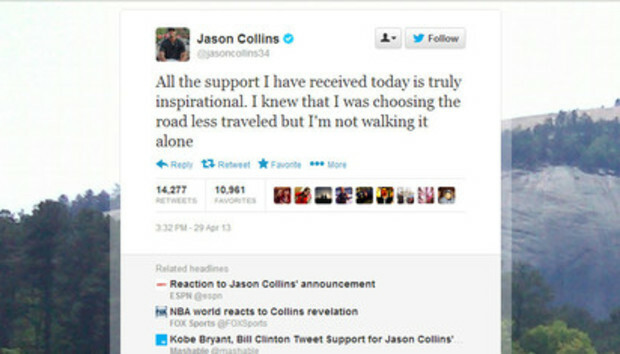 The social network on Monday detailed the new feature in a blog post using NBA player Jason Collins as an example of how related headlines work. Collins came out earlier this year and tweeted about the support he received--dozens of news outlets embedded his tweet in their stories about his coming out, which offer more context than Collins himself did. Twitter is fast becoming a major source of breaking news, but its terse, high-speed nature can leave a lot to be desired. Misinformation abounds. The network for its part has strived to work with news organizations--every major media outlet uses Twitter to post news bulletins and find sources. Embeddable tweets and Vines make it easy for journalists to include firsthand quotes and videos when covering major events. Now avid Twitter users can find stories about those events without piecing together a patchwork quilt of secondhand information.